A commitment to spreading a message of peace for all beings. A celebration of the vegans + activists of the world and a space to inspire others to join the movement. 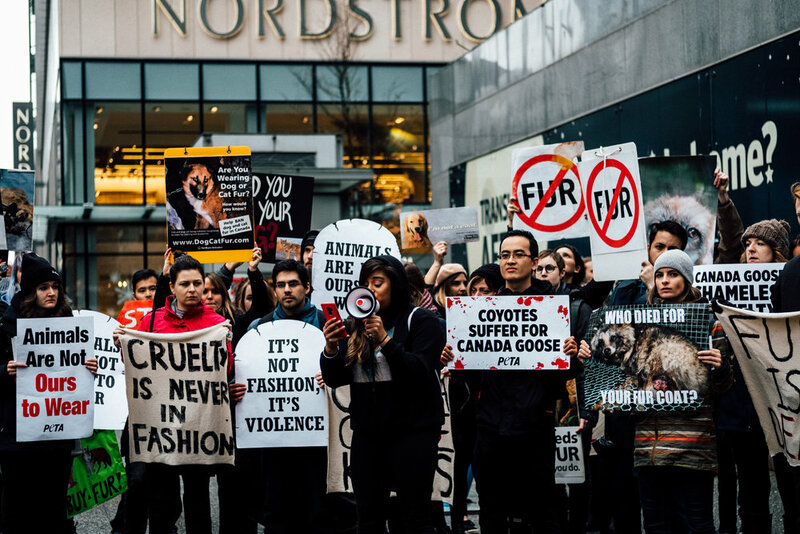 This past weekend, Vancouver activists marched in solidarity with Toronto and New York City animal rights groups to let the public know that fur is cruel, unnecessary and unacceptable. With the recent opening of a Canada Goose storefront in Vancouver, and the fact that Canada Goose kills up to 15 animals per jacket, this was inevitably one of several stops on the march. We marched throughout the Pacific Centre and made further stops at Holt Renfrew, Winners and at Nordstroms (who locked their doors in response to us). We marched, chanted (‘THEIR FUR - NOT OURS’, ‘IT’S NOT FASHION - IT’S VIOLENCE’, ‘WHAT DO WE WANT? ANIMAL LIBERATION! WHEN DO WE WANT IT? NOW!’), and gave out pamphlets with information about the cruel fur industry. Many people gave us nods of approval and accepted our message. Many others walked by in Canada Goose jackets, demonstrating body language of shame or embarrassment and hiding their faces (ironically behind the dead animals on their hoods). Do you have a jacket with fur, down or other animal materials? Have you thought about the inherent suffering that your purchase has caused? Would you wear your dog? 1. Not purchasing clothing made from animals (boycotting fur, leather, wool, angora, silk, etc.). You can also shop for vegan alternatives like Wuxly, but the ultimate cruelty-free jacket is a vegan one that already exists - check your local thrift shops! 2. Removing the fur trim and label from your existing Canada Goose jackets to avoid promoting and marketing their cruelty to others & donating your fur trim to a nearby animal shelter or sanctuary to provide comfortable bedding for rescued animals. If you need help locating a space to donate your fur trim, contact me and I will help you. 3. Trading in your non-vegan jacket for a vegan alternative. Wuxly offers up to $275 off their animal-free jackets when you trade in your down-filled and fur-lined jackets. They have partnered with homeless shelters across Canada to give these donated non-vegan jackets to people in need. 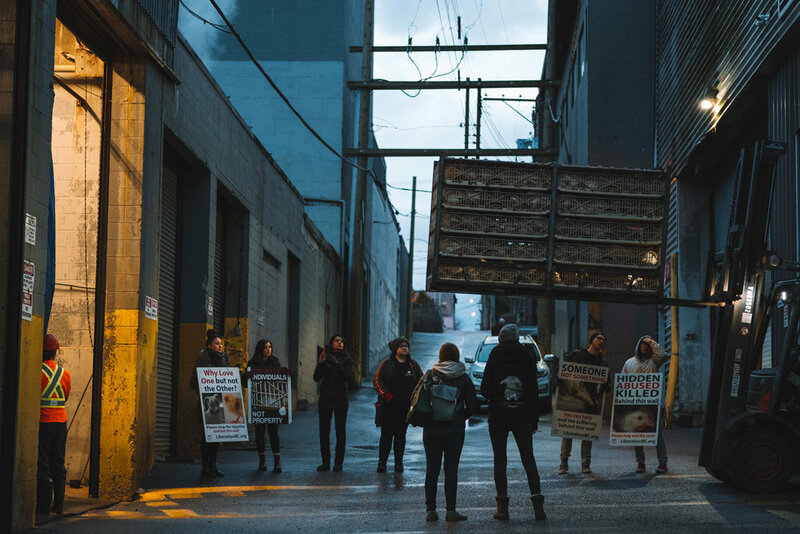 Join Vancouver Fur Animal Save or your local animal rights groups, attend future events, and make our voices louder and stronger for the animals. Tell your friends and family: #FURISDEAD and you will NOT support it. If slaughterhouses have nothing to hide, why are they built as windowless buildings? Why are children not brought to visit them on school trips to see how their 'food' is 'made'? Why, when Vancouver Chicken Save was established, did Hallmark Slaughterhouse put up large tarps in the alley to block the public view of the kill floor? Why have they now installed fences to block the alley from public access completely? The animal agriculture industry thrives on fuelling the majority's preference to remain blissfully ignorant in what is happening to animals globally. 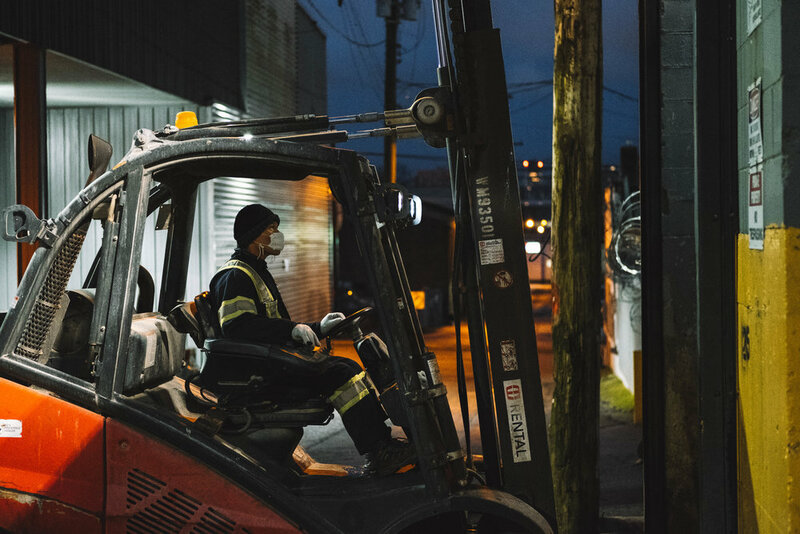 Vancouver Chicken Save has quickly adopted to bearing witness to chickens on trucks within just a few days of the fence installations. We are here for the animals and we are not going away. 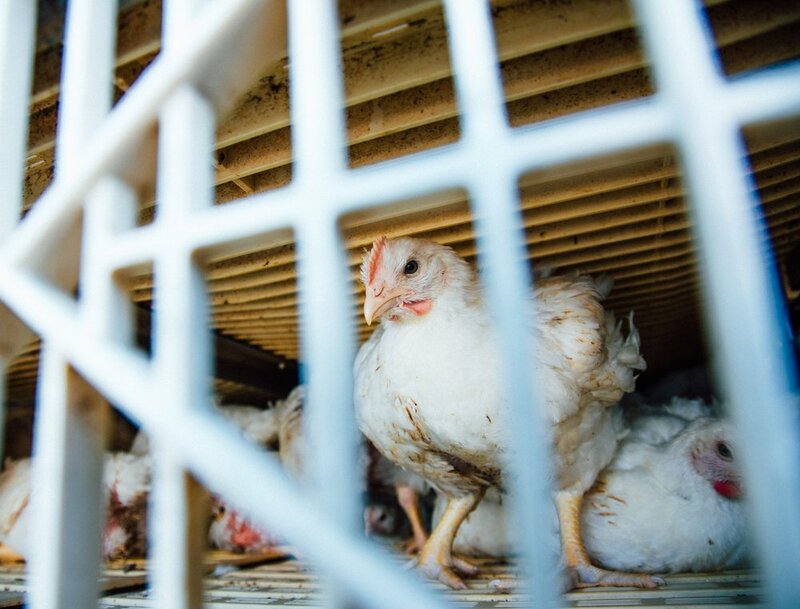 Tuesday, July 31 marks our first vigil asking trucks to stop for 3 minutes so that we can bear witness to the baby chickens, share their stories, and truly see them in this one stage of their lives of victimization and exploitation. 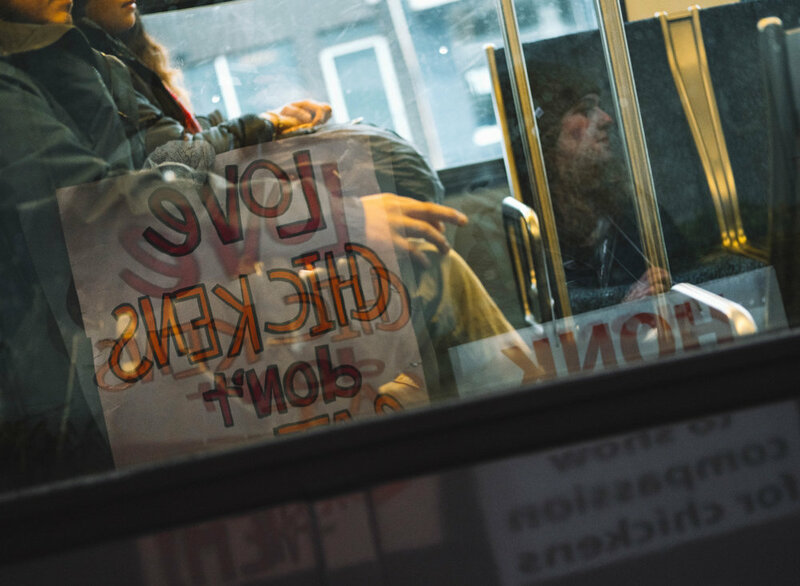 What is different about this new form of bearing witness from the activists' perspectives? More time spent with the animals means more connection, more grieving, and a truer and more powerful concept of reality. There was an obvious extension of aggression and mistreatment of beings from the workers towards humans - something that is sadly inevitable in a workplace that is built on violence. Some truck drivers were extremely aggressive to the point where I seriously feared the safety of my fellow activists and friends. Workers laughed, insinuated that we were crazy, and motioned for the trucks to keep driving despite several humans being within inches of the truck front and in danger. It was emotional and difficult, but as always - it was nothing compared to what the animals are going through. At Hallmark Slaughterhouse in Vancouver, about 90,000 chickens are killed each day. Globally, more than 150,000,000,000 land animals are killed every year. These chickens are only 30-40 days old, despite the fact that healthy chickens can live to 10-20 years. These chickens are confined, crammed, and filthy. What's coming next for them on the kill floor is beyond what most of us can even imagine experiencing. Animals feel pain, they have families and they want to live - just like us. I challenge you to take a quick look at the Animal Slaughter Counter and to watch the newly released and highly accredited film Dominion to begin to comprehend the gravity of their situation. Try Challenge22, a free 22 day vegan challenge with access to recipes, tips, videos, more than 400 mentors and even professional nutritional support. Check out my Resources page for my top documentaries, books, recipe sites and more. Please consider what you would want others to do if you were in the place of the animals and take a stance against cruelty. 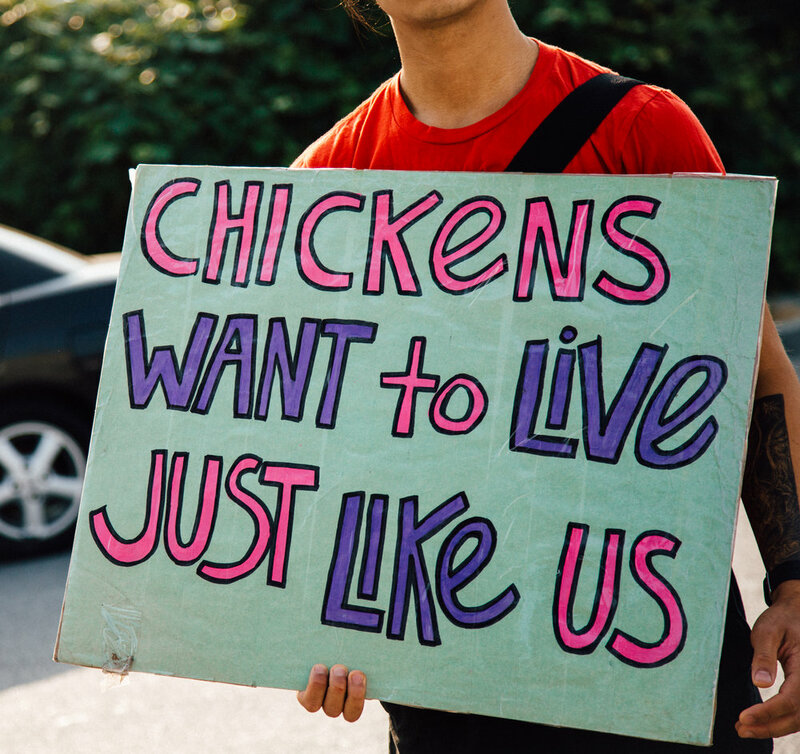 Join Vancouver Chicken Save, find a save group near you, or start a new chapter. Find and join a vegan facebook group in your region for support and community from fellow animal lovers. Whatever you decide to do, please start making steps towards liberating the animals from their unnecessary suffering. Together we can make the world a more loving place. Vancouver Chicken Save activists met at 5am on Saturday, March 24th to begin a 13 hour vigil in honour of Bao Min Cheng, a worker who passed away of heart failure after a 13 hour shift at Hallmark Slaughterhouse, and in honour of the chickens who are intentionally killed here each day. 51 activists came out and thousands of people were exposed to our message, which was simple: slaughterhouses are hell for the animals and hell for the workers, and we are capable of making more compassionate choices. Each day, 90 thousand chickens are killed at this slaughterhouse in Vancouver. These individuals are almost always babies and are always completely innocent. They have families, they value their lives, and they want to live, just like us. Our 13 hour activism "shift" was spent bearing witness to the chickens in their final moments of life, while also discussing and honouring the human victims of the industry with each other and with the public. Slaughterhouse workers are often immigrants who have many barriers to employment and are left with no other option but to work in such violent places. They suffer from trauma, mental health disorders and exhaustion from being overworked and exploited. Bao Min Cheng was consistently working 70 hour work weeks when he passed away of heart failure. Due to misinformation and numbed compassion, I believe the consumers of animal products are victims of the industry, too. However, as this message is hitting the streets and the mainstream media more and more often, people are becoming aware of the injustices within the industry and are becoming very receptive to learning about veganism. The amount of honking, thumb ups, fists of solidarity, and nods of approval from the vehicles passing by was really encouraging. 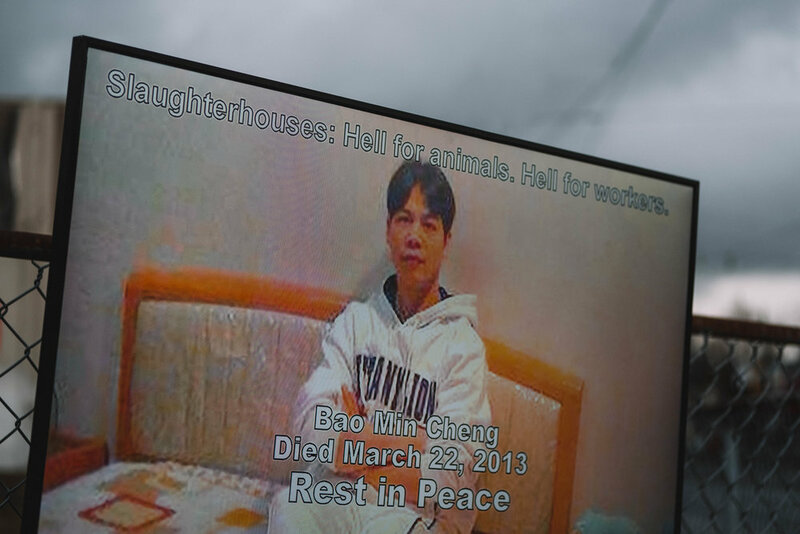 In honour of Bao Min Cheng, who had a family with 4 children when he passed away at the young age of 42, and the 90 thousand chickens who are slaughtered at this location each day, thank you for opening your eyes and hearts to this message. I joined Anonymous for the Voiceless for a 3 day cube of truth (+ wall of truth) marathon at a busy transit station in Vancouver on the final 3 days of 2017. We shared powerful footage of industry-standard (yet rarely seen) factory farm and slaughterhouse procedures and had educational conversations with the public as they watched. When Paul McCartney said "If slaughterhouses had glass walls, everyone would be a vegetarian," vegetarian was the word for vegan. What he meant, and what is so true, is that if animals were being abused outside of the windowless + camera-banned concrete walls of slaughterhouses, the injustice would be exposed and people would reject it. The cube of truth shows people what's happening to animals worldwide, at all times, and behind closed doors. It's the truth - and the truth will set you free. As people got off the subway/bus and walked by this busy intersection (Cambie + Broadway), they were drawn to our display and curious about our message. 1. 50% of baby chicks that are born are either ground up alive or suffocated in a plastic bag in their first few days of life, simply because they were born male and therefore are not profitable to the egg industry. 2. Baby cows are taken from their mothers within a few days of birth so they do not 'steal' milk ($$$) from the industry, and they are then slaughtered for veal. 3. Humans thrive on a whole-foods plant-based diet. I was grateful that we were openly and genuinely appreciated by the people we encountered. We were given many hugs. We were thanked over and over for our time and efforts, for displaying important footage, and for the conversations and resources we shared. We were completely respected on the streets of Vancouver. In the final 3 days of 2017, 77 animal rights volunteers worked together to reach crowds of people, with an estimated 360 individuals who were empowered and ready to embrace veganism after meeting us. Here's to living with compassion + truth on our sides in 2018! 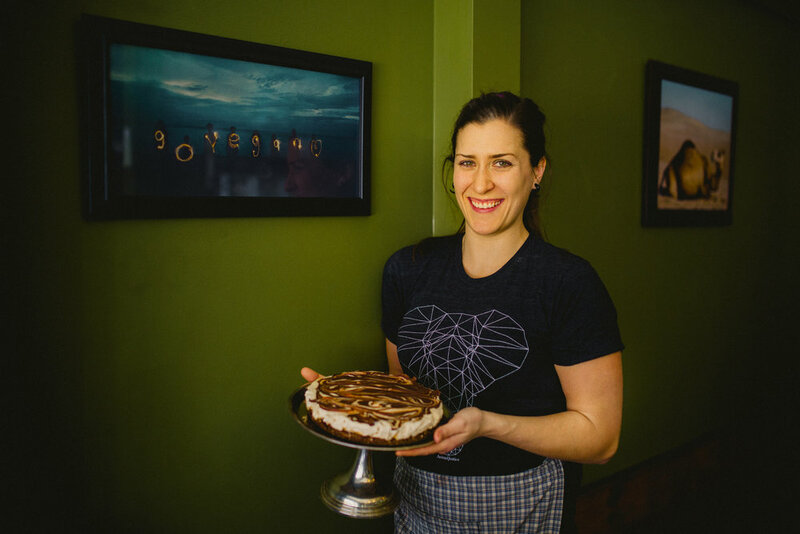 Alex is the baker for Greens Organic Cafe, Sarnia's only vegan establishment. She is a down to earth girl who loves helping friends, rescuing animals, and enjoying the great outdoors. We played on the same hockey team and once I found out she was vegan, I had one of those 'Did we just become best friends?' moments. Along with baking at Greens, she also works as a veterinary technician, a job she describes as "dedicated to helping domesticated animals and practicing the best possible medicine to keep them healthy." When talking about her job, she described how there is "an oath for Veterinary Technicians stating that [they] must provide excellent care and services to animals by alleviating animal suffering". One day Alex realized the hypocrisy in dedicating her life to saving animals while causing others to suffer through her food and lifestyle choices. She realized that all animals are living beings that feel pain and love, so she asked herself an important question: "Why love some (dogs and cats), but eat others (pigs, chickens and cows)?" So she went vegan. Go Alex! Alex says that in her daily life, she constantly strives to be a better person and to implement a brighter world for everyone to enjoy. She's one heck of a baker + person and I wanted to celebrate it all - so I took some photos of her doing her vegan thang and asked her some questions about her lifestyle. Q. What is the best part about being vegan? Alex: The way you feel. Not just physically (I have so much energy), but also emotionally. I now have the peace of mind that I didn't harm and end a life in order to enjoy something as simple as a meal. Plus, vegan food is so yummy! Q. What can you recommend to the readers who want to adopt a more peaceful lifestyle? Alex: I think everyone should watch nature documentaries like Planet Earth and Frozen Planet. They show how beautiful and peaceful our world is (without human intervention), and they remind us how important it is that we all take actions to preserve the land and the many species that we share it with. 'Eating Animals' by Jonathan Safran Foer is a great read. Jonathan spent three years researching factory farming, discovering how food gets from farm to plate, and searching for ethical animal husbandry, only to find out that it simply does not exist. The book discusses our eating habits and how they are influenced through things like folklore, pop culture and family traditions and how we come to allow ourselves to justify such a brutal ignorance. The book ends very profoundly: “If nothing matters, there’s nothing to save". That's a strong sentence. We really need to stop being so blind to what goes on behind closed doors and start taking action to save our world. Q. What has been the hardest part about being vegan and how do you get through it? Alex: People think it is hard, but really it isn't. Living a vegan lifestyle is simply about changing some of your habits. With all of the animal friendly products and companies nowadays, it is very easy to be vegan. People are becoming more conscious of what they eat and where their food comes from, making it easy to enjoy vegan food while dining out. There are tons of great vegan restaurants like Greens popping up all over the world! More and more people are realizing that veganism is necessary for a healthy future and I believe that a peaceful, vegan world will exist very soon!